projects across Africa collectively valued in excess of $2 billion. Ladé was an Enterprise Development Specialist at the UN Food and Agriculture Organization (FAO) and also worked for the QED Group LLC in Washington, DC. 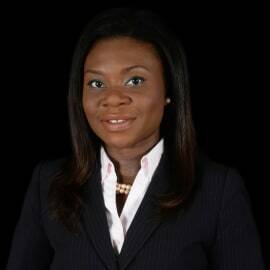 She holds a Master of Business Administration (MBA) degree from Thunderbird School of Global Management and a dual Bachelor of Business Administration (BBA) degree in Management Information Systems (MIS) and International Business from the University of Oklahoma. A native English speaker, she is fluent in French and Italian and has basic knowledge of Spanish.